Airtel introduces 5 new smart recharge prepaid plans starting at Rs 34..
General News: Airtel introduces 5 new smart recharge prepaid plans starting at Rs 34..
General News Airtel introduces 5 new smart recharge prepaid plans starting at Rs 34.. In September this year, Airtel introduced six smart recharge prepaid plans starting at Rs 25, and going all the way up to Rs 245. The plans offered a minimum validity of 28 days, maximum up to 84 days. Users also got a minimum of 100MB data, and maximum of 2GB data with these plans. While Bharti Airtel later did away with the Rs 25 plan, it has now introduced five more plans that offer same data and validity benefits, and better-calling benefits. Here’s a look at these plans and what they offer. This is the cheapest plan from Airtel that offers 28 days validity, 100MB data and a talk time of Rs 25.66. Outgoing calls will be charged at 2.5 paise per second when calling in home network. This plan also includes 28 days validity, but outgoing calls within the home network are a bit cheaper at one paisa per second. The plan also includes 200MB data, and talk time of Rs 54. Just like the Rs 64 and Rs 34 plans, the Rs 94 plan also comes with 28 days validity. Users get 500MB data, and a talk time of Rs 94. However, there is a benefit in outgoing calls in home network – they are now charged at 30 paise per minute. This plan offers a validity of 42 days, and outgoing calls in home network are charged at 30 paise per minute. 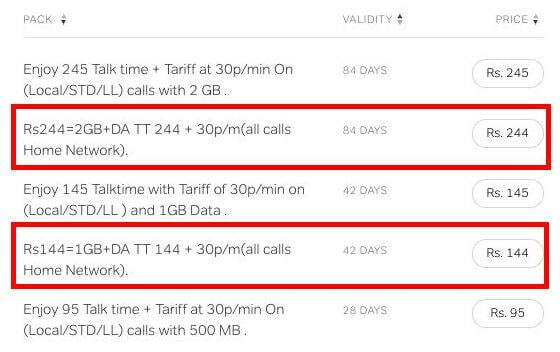 Airtel has also bundled 1GB 3G/4G data, and a talk time of Rs 144 with this plan. With the Rs 244 plan, users get a validity of 84 days, and talk time of Rs 244. The plan also includes 2GB 3G/4G data, and outgoing calls are charged at 30 paise per minute.